Welcome to Today@WKU, the daily newsletter from WKU Public Affairs, for October 19, 2018. WKU to host 2018 Kentucky Academy of Science meeting Nov. 2-3: WKU will host the 104th annual meeting of the Kentucky Academy of Science Nov. 2-3. Over 450 Students to Participate in Fall Super Saturdays: Codes and Ciphers, Engineering in the Wilderness, and Create Your Own Chinese Masterpiece are a few of the 36 classes bringing over 450 students from across the region to WKU’s campus in Bowling Green and to the Kentucky Science Center in Louisville. Opening Reception Tonight for WKU Stickwork Project: WKU’s Cultural Enhancement Series and the Kentucky Museum invite you to an opening reception for the Stickwork Project at WKU featuring artist Patrick Dougherty will be tonight in the Kentucky Room. The reception begins at 5:30 with remarks at 6. Basketball: Hilltoppers, Lady Toppers Kick Off 2018-19 Season at Hilltopper Hysteria: Basketball season returned to The Hill on Thursday night as WKU hosted its annual tip-off event, Hilltopper Hysteria presented by associate sponsors Complete Nutrition, Hilltop Club and Overtime Sports Bar and Grill, at E.A. Diddle Arena. The Hilltopper and Lady Topper Basketball programs were on display for two hours, and the night featured player and coach introductions, scrimmages by both programs, shooting challenges, performances by the WKU Cheerleaders and Topperettes and an autograph session to end the festivities. Men’s basketball: Hilltoppers Picked as C-USA Favorite; Hollingsworth, Murray Named to Preseason Team: For the first time as a Conference USA member, WKU Hilltopper Basketball has been picked by the league coaches to win the conference. The Hilltoppers were selected as the C-USA favorite in the annual preseason poll, while WKU graduate senior forward Desean Murray and sophomore guard Taveion Hollingsworth were selected to the Preseason All-Conference Team, the league office announced Thursday. Volleyball: C-USA Championship Rematch Set as North Texas Visits The Hill: WKU Volleyball returns home tonight for a rematch of the 2017 Conference USA Championship tilt with North Texas visiting The Hill. First serve is slated to go up at 6 p.m. CT as from E.A. Diddle Arena. Both sides are looking to get back on track after suffering losses their last time out. Soccer: WKU Heads to UAB for Final Regular Season Road Match: Riding a four-match unbeaten streak following a pair of draws last weekend, WKU will look to continue its push for a C-USA Tournament berth tonight at 7 as the Lady Toppers travel to Birmingham, Ala., to battle UAB. Keeping students safe on the hill and online at "Stay Safe WKU": Safety is a top priority for WKU. “Stay Safe WKU” is an event aimed to teach students new safety tips. WKU Libraries offers charitable alternative to paying fines: At some point in our lives, most of us have probably received a fine from our local library for an overdue book. The libraries at WKU use that same system, but instead of having to pay cash, they're offering students a more charitable alternative to get them off the hook for those books returned well past their due date. 1 p.m.: Carden International Circus. L.D. Brown Agricultural Exposition Center. Order tickets online. Contact Ag Expo Center, (270) 745-3976. 3 p.m.: WKU Choral Concert. Van Meter Hall. Admission is $5; $3 for students. Contact Music, (270) 745-3751. 5 p.m.: Carden International Circus. L.D. Brown Agricultural Exposition Center. Order tickets online. Contact Ag Expo Center, (270) 745-3976. 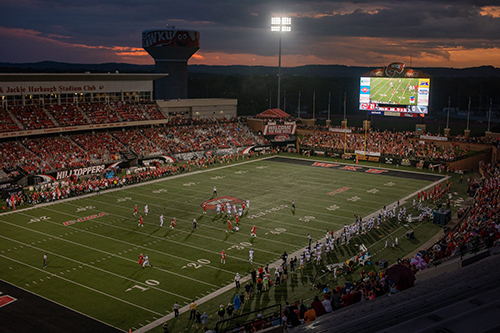 5:30 p.m.: WKU Horn Day. Ivan Wilson Fine Arts Center Recital Hall. Contact Music, (270) 745-3751.